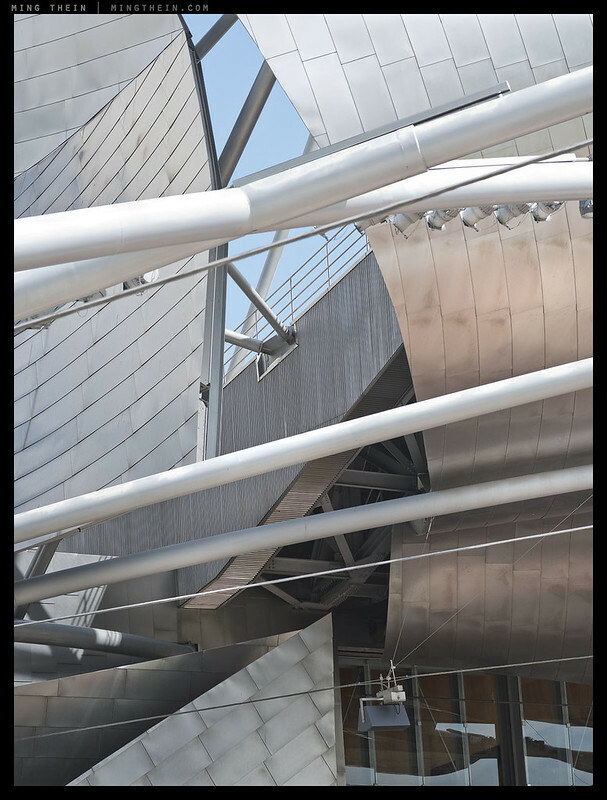 Chicago can be considered both a city of architects and in a way, a city for architects; despite the huge number of other famous buildings in the city, I found myself particularly taken by the form and execution of the Jay Pritzker Pavilion in Millennium Park. 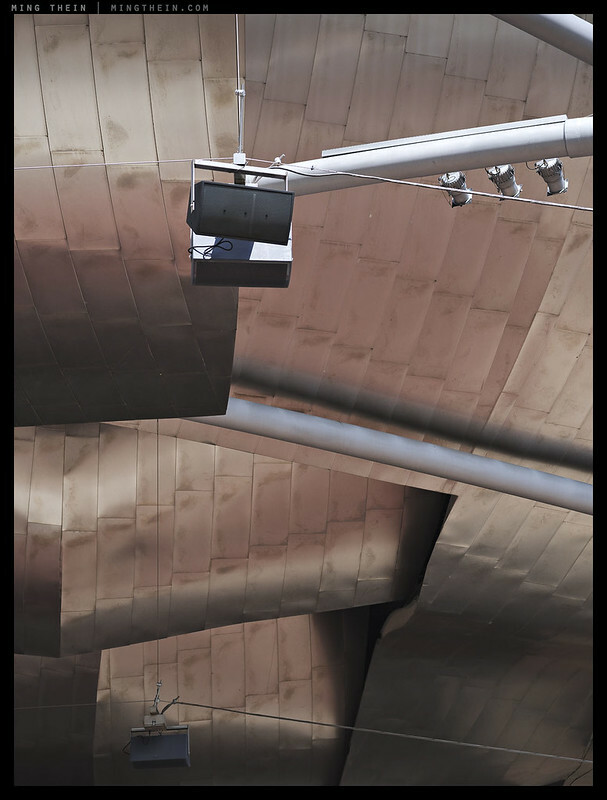 Perhaps it was because it was my first encounter in person with a Frank Gehry building – they’re understandably somewhat thin on the ground in Asia. It probably didn’t do any harm that I also happened to go on a day where the sky was throwing up a fantastic assortment of clouds and light; if you didn’t like the arrangement of cumulus, just wait a few minutes for a fresh one. And of course late September in Chicago means that the light is never directly overhead, because the sun sweeps over the horizon in an arc – making any time of day fair game to shoot. 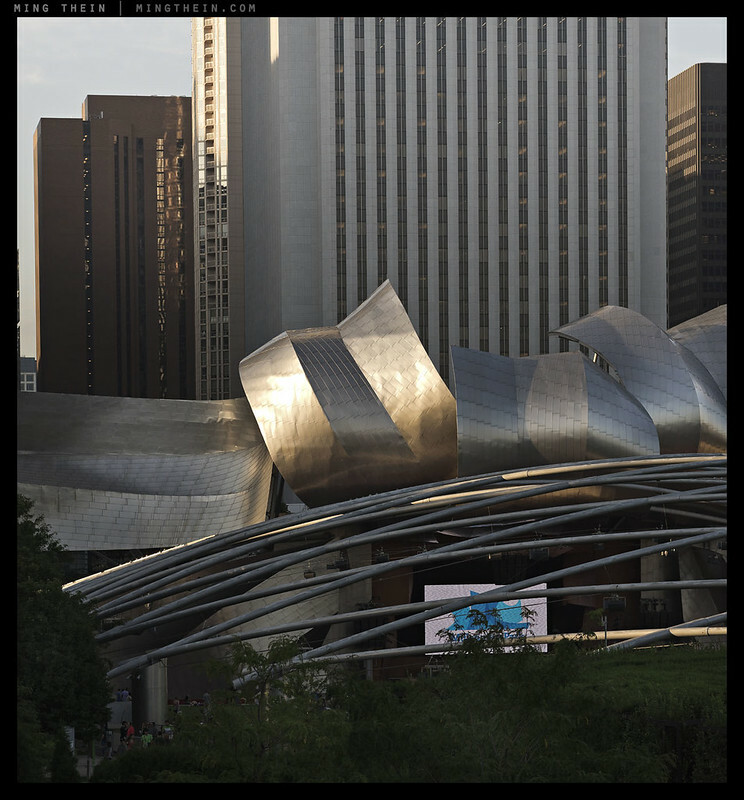 The pavilion was named for Jay Pritzker, Hyatt Hotel chain founder and of course establisher of the Pritzker Prize for Architecture. 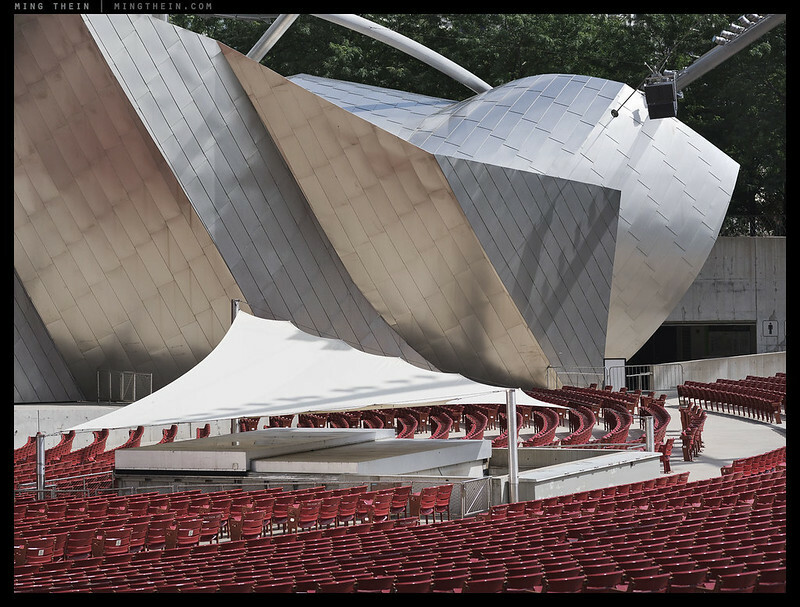 (I did wonder on more than one occasion if this building would be eligible for the prize if it were to be entered…) The building itself is notable for a few things aside from Gehry’s trademark curved and twisted metal cladding forms – the bandshell has no internal columns or pillars to obstruct the audience’s view; speakers are placed every 21m on another pillarless overhead truss for active reinforcement of sound from the top and sides to define a space acoustically; and the outer steel cladding had to be made with extremely low tolerances of 0.125″ (3.2mm) – compared to a standard 1-2″ (25-50mm). Access is supposedly also meant to be free for the public even during events, though this has raised some controversy. The pavilion, seating and lawn areas are built on top of a large underground carpark which remains very well concealed from pedestrians at ground level. 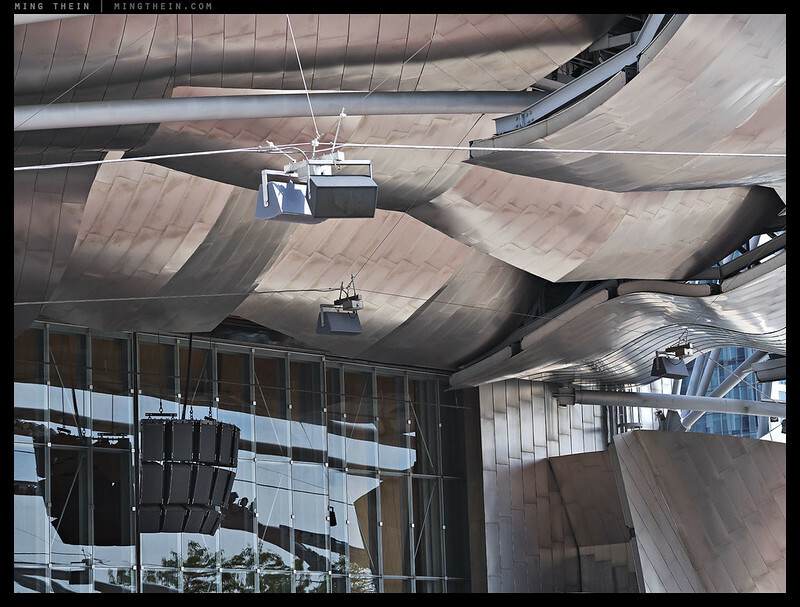 Having attended an event one evening at the venue (no images, I was enjoying the sound), I can say that the acoustics really do work, and work surprisingly well – you really do get the feeling that you are sitting inside a concert hall rather than an outdoor space; there isn’t the same sense of solely monodirectional sound with attenuation above and behind that other outdoor performances generate. One can only assume it’s the very elaborate speaker system doing its job – though I do wonder if performance will eventually degrade over time since everything is exposed to the elements, including bird deposits – which cannot possibly be good for moving acoustic components! I’m sure you got some of the nearby “Bean.” I got one as massive thunderheads rolled in looming over the skyline’s reflection in the polished 3-d shape. Plenty. They’re in another series. Wow, I love it! 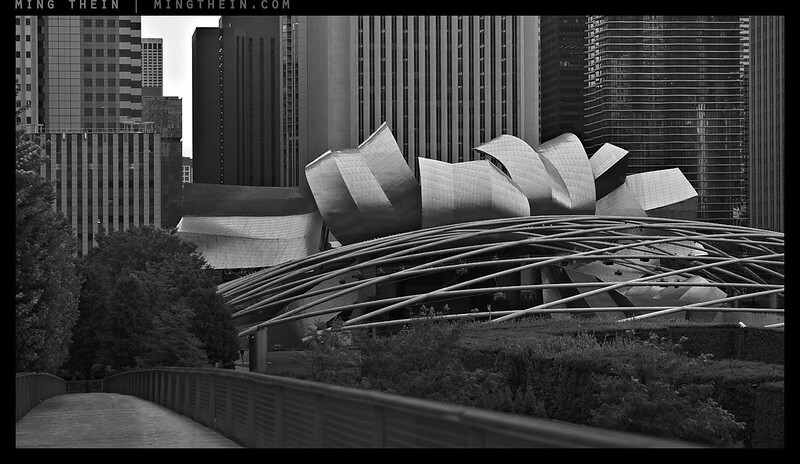 You have inspired me, I am going to try to get access to the Frank Gehry-designed molecular biology laboratory at Univ. of Cincinnati (my home town, I visit it often). 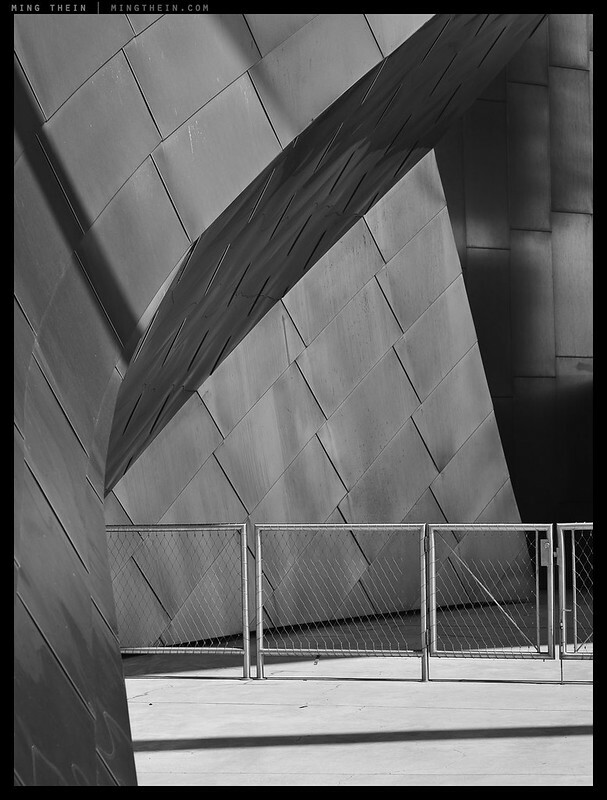 It is not as elegant or elaborate, and is made of ordinary brick, but still, there are plenty of non-orthogonal angles in the structure, enough so that I think of it as the Mutant Building. 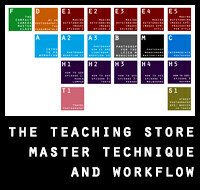 The lab furniture inside is guaranteed to be all-orthogonal catalogue-order furniture, though – I have seen it through the windows. No doubt some interesting angles here Ming. Also as always good selection for colour vs b&w. I would have to say the last one is my favourite. And very important to do so as well. That plus your captioning (albeit not in this set and not necessary either) adds massively to the viewing experience! The Skyline reflection and the first shot of this series is an…..am I allowed to use this word? ?….”epic shot/work”?? The tenth, eleventh and fourteenth are gorgoues too, love your composition/framing! PS: But please if you have enough time of course;), give your works a name/title as you usually do, its easier to say which of them impressed us the most…;) and additionally most of your given titles are as excellent and appropriate as the works on their own. Another point for “pro” titles is that maybe someone see/focus on something different while looking at your work for the first time than what you were focusing on or saw while taking/capturing the shot! So the title may help /assist us to get it on the second look ;)! Wonderful. 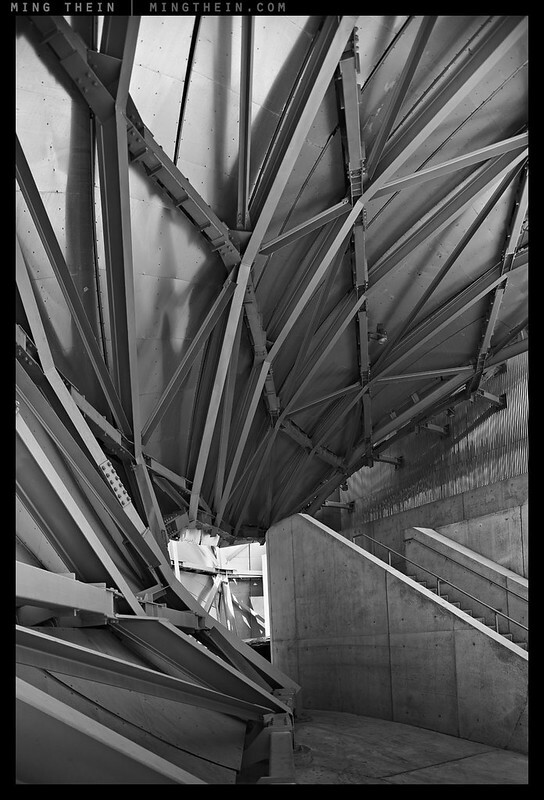 You did a great job of capturing one aspect of the beauty of the Pavilion: it’s architectural art. You could absolutely do a second series capturing the other side: how people interact with and enjoy it. 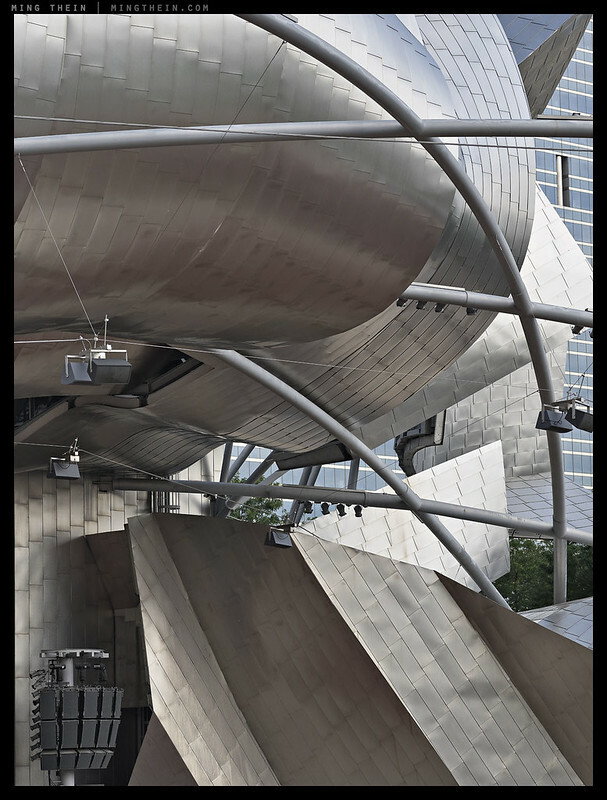 I lived about a mile away from Millennium Park a decade ago, and I loved it enormously, especially Pritzker Pavilion, and the Cloud Gate (the Bean), and the BP Bridge (the Snake Bridge), and the Crown Fountain, and so many other features. 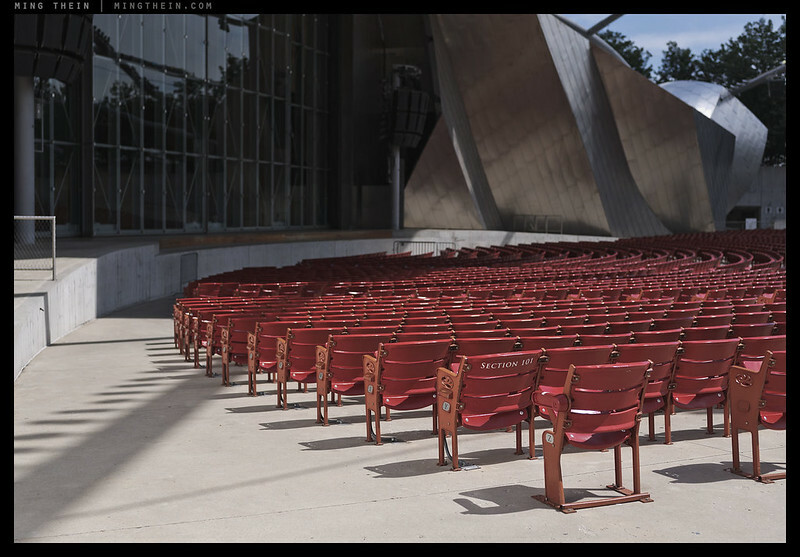 I remember when Millennium Park opened, the reception was mixed: partly because everything is corporate-sponsored (a necessity to get the park built), and partly because of the then-strangeness of the Pavilion. Talking to friends who’re still there and having visited a couple times since I left, both the park and the Pavilion seem to be pretty much unanimously appreciated now, though. 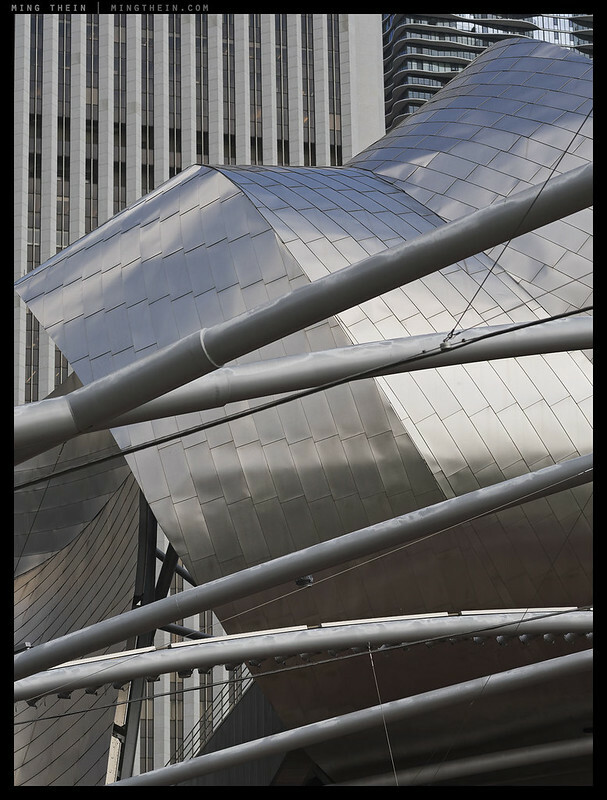 All of the features seem to have aged well – especially the Pritzker – and people have learned to look past the corporate branding. Thank you. The way I see it…so long as we get the opportunity to appreciate these creations, why does it matter if somebody takes the credit for paying for it? I’m with you Louis, I’m there frequently and photographed. But only had an image or two memorable. Nicely done Ming! Thanks, Ming. I always enjoy your architectural work. 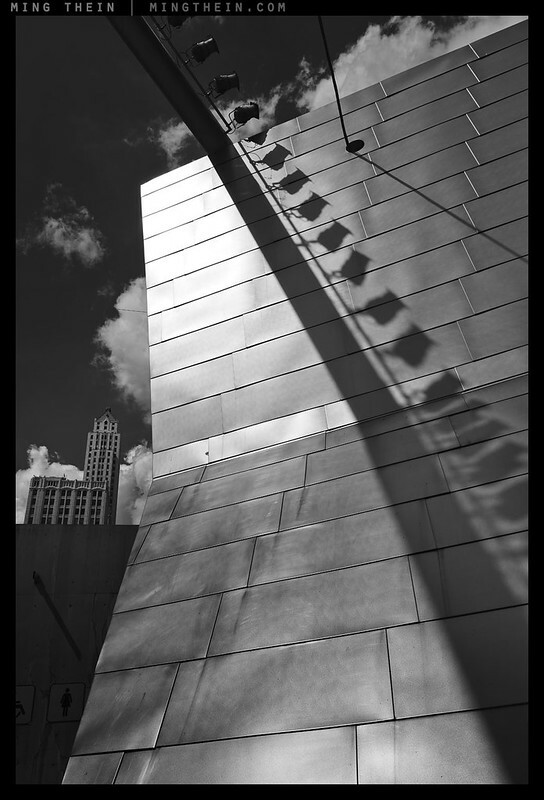 Chicago is a stupendous place for photography going all the way back to the Chicago Institute of Design with Moholy-Nagy, Callahan, Strand…. 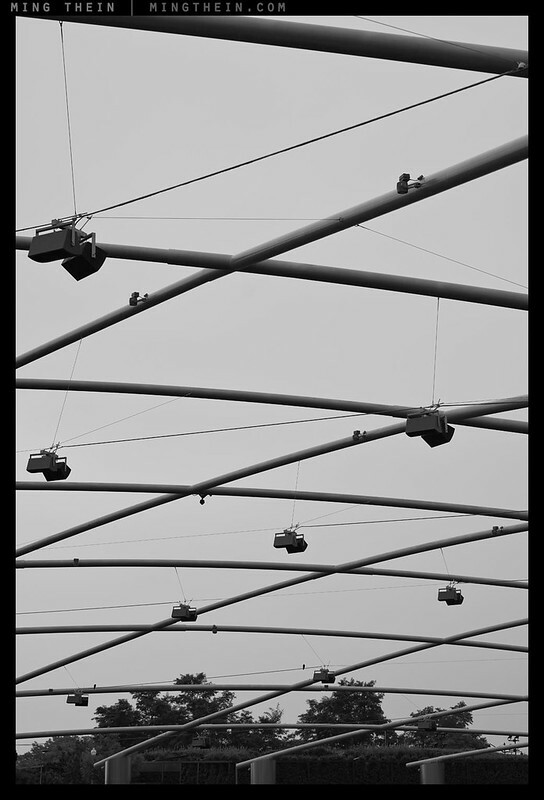 Millennium Park is a wonderful place. Wonderful light, fantastic trees, great buildings and fantastic people. 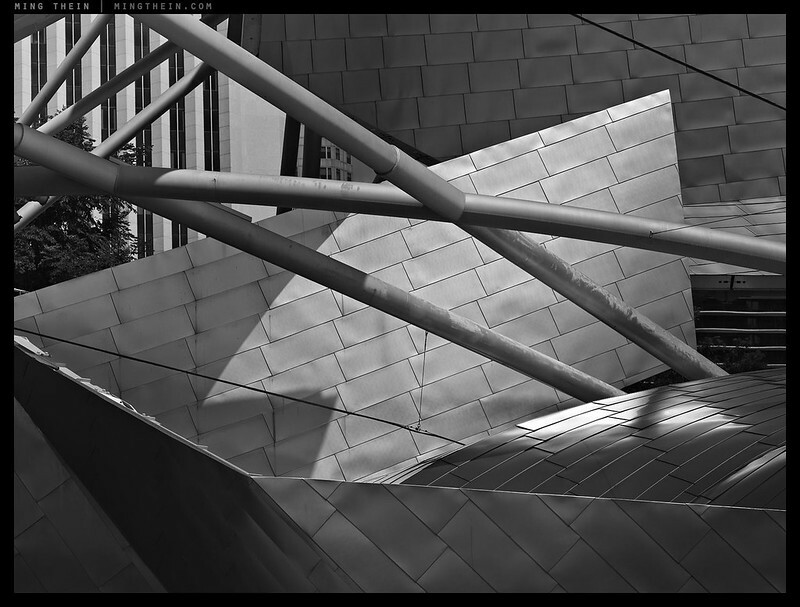 FWIW, the Art Institute’s modern wing is impossibly excellent with many views of the Band Shell. They also have a great collection of classic photography. You can wonder around the museum taking pictures to your heart’s content, it’s perfectly OK. Since everybody’s doing it, you can get lots of pictures of people looking at pictures. It’s absolutely fantastic for the architecture lover; like walking through a working museum of history. Exceptional and superb! You are my favorite “urbanscape” photographer! Very, very nice. 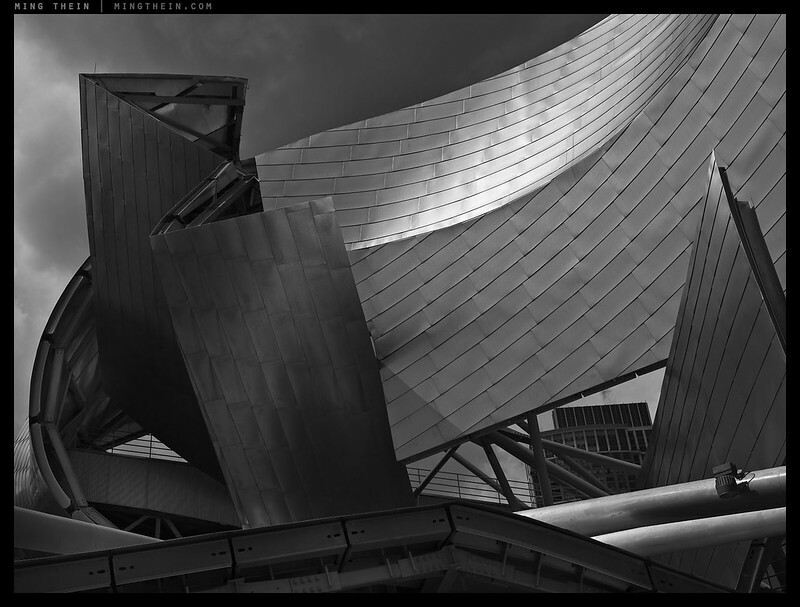 This last Sunday I visited the latest Frank Gehry museum, the Fondation Louis Vuitton in Paris, and I have always been fascinated by the Guggenheim in Bilbao, Spain. 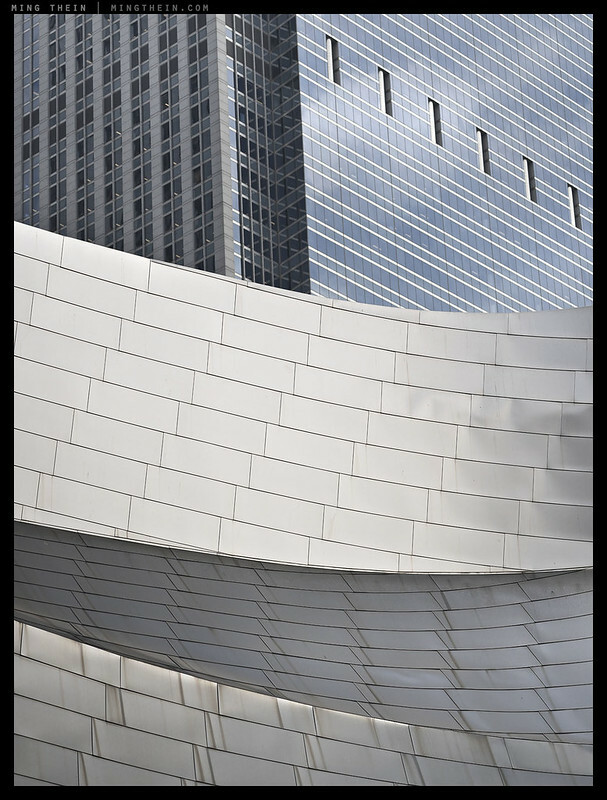 Buildings as works of art. 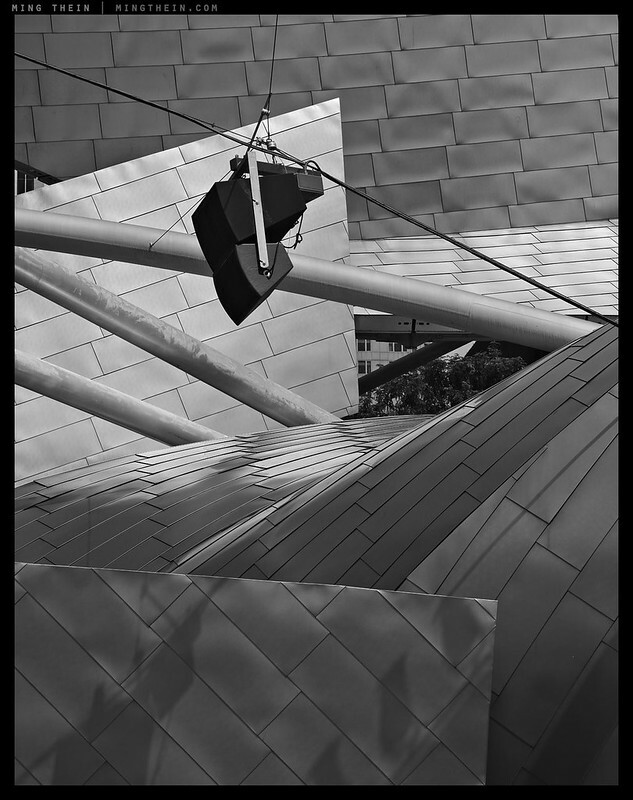 Just as at the Guggenheim in Bilbao (the only other Gehry museum I have visited), the interior spaces go from average museum size to huge, with the required accesses, elevators, etc. But just about every piece of the structure is unique (think Eiffel Tower or Statue of Liberty as other examples), an incredible design and construction effort. Personally I think the man is a genius. To get an inkling, this video gives an idea of the Bilbao museum. Impressive – thanks for the link! It is genius. Not ‘beautiful’ but direct and thought provoking modernism. Braque is the closest I can come as reference. Bilbao? Bilbao! 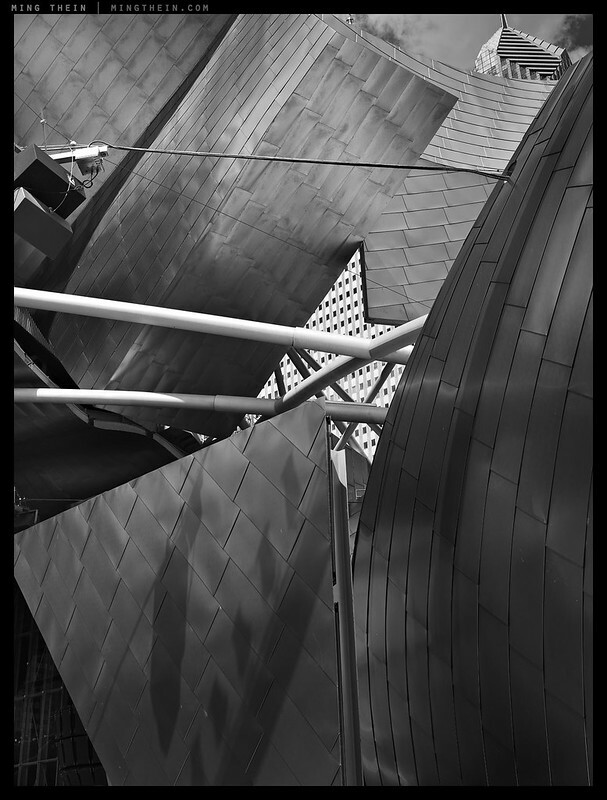 Ming, the intricacy of the Pritzker (Gehry) must have made it difficult to isolate what you want? Another great set! 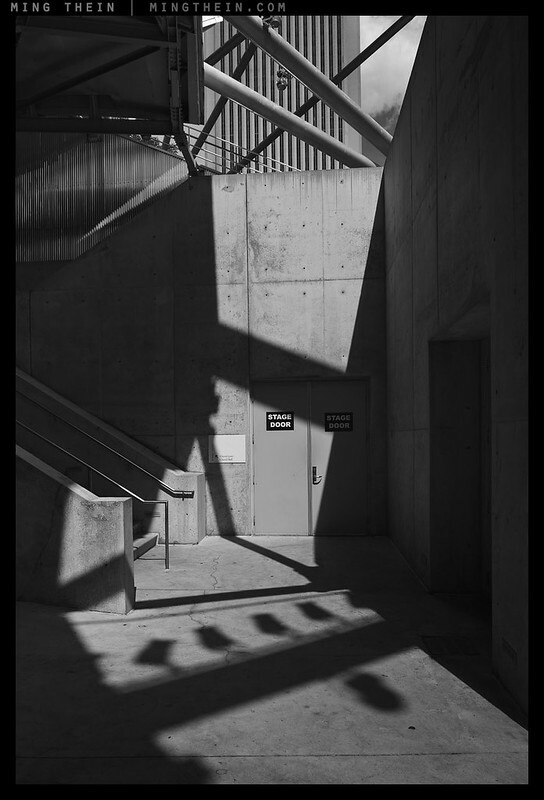 I was suddenly stuck, looking through the images, how some of your architectural photography reminds me of high end car photography. It’s a bit difficult to explain why, but I see the same emphasis on lines and details. Do you think there’s any crossover at all in technique? Stunning photography Ming. Glad there will be a Masterclass there. I feel a terrible strong desire to be in such a place surrounded with such wonderful man made geometry. I do not see a single human beeing in this interesting series of pictures – strange for MT-photography. Beautiful work Ming! Great that you could attend an event there! Brilliant building and brilliant images! 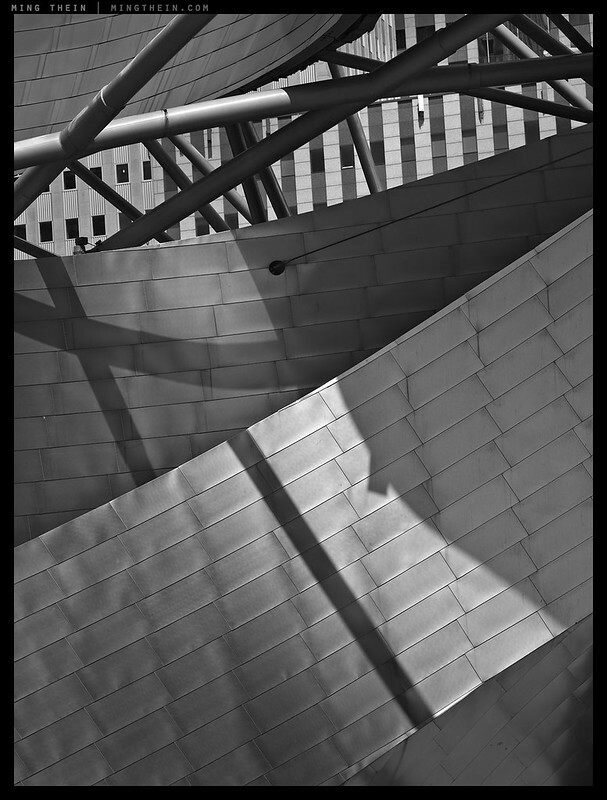 I probably spend at least one day a week during the summer time in Pritzker Pavilion and have never quite been happy with the photographs I’ve gotten there. Maybe mental over-exposure to the same place (often just for concerts or to enjoy a summer day) makes the creativity go away? I definitely see some angles you’ve shot that I’ve probably seen hundreds of times but was never able to photographically conceptualize. Very satisfying photo set, well done. Thanks Louis. I suspect it’d be the same with myself and a visitor to Kuala Lumpur; very easy to get saturated if you see it all the time. Very nice series Ming, thank you for sharing.